I have really enjoyed coaching. It's a great experience. Every player should have the chance to do it. The problem is, I'm not that good at it. Peter Vecsey (May 26, 2000) "Looks Like Larry's Indy Mood to Stay", New York Post. Well, I don't worry about ratings. I'm trying to win a ballgame right now. Whatever it takes to win a ballgame, we're going to do it. If it takes a four-hour game, that's what we have to do. Marty McNeal (June 11, 2000) "Bryant: A Game-Day Decision - Magic Had to Convince Him to Stay Out After Friday's Injury", The Sacramento Bee, p. C13. Michael Marot (May 24, 2000) "Pacers Notebook/Pacers Make Turnaround", The Journal Gazette, p. 2B. Sam Smith (February 14, 2000) "Bird's Flight Path May End at Boston", Chicago Tribune, p. 12. Douglas S. Looney (May 22, 1998) "Larry Bird : Doer and Teacher", Christian Science Monitor, p. 8. Sam Smith (February 17, 1998) "Making a Run From the Border", Chicago Tribune, p. 5. There is nothing better than being out there when the game is on the line; only now, I get to see what my players will do. How will they react? Retirement is fine for some people, but I got bored. I'm used to more of a fast-paced life. Ailene Voisin (February 3, 1998) "Bird on the Bench - Larry the Legend Comes Home, Wins Accolades as Coach", The Sacramento Bee, p. D1. I know the rigors of the NBA and what these guys can expect. I know my job is to prepare them, to get them in shape. We'll find a good offense and a good defense. And then let's do it. Bob Ryan (October 31, 1997) "Bird Setting Feverish Pace With Indiana", Boston Globe, p. E1. Dan Weber (October 30, 1997) "Life Is Still Good For Coach Larry", Post-Tribune, p. C1. When thou was a player, I didn't expect my teammates to play the way I did. I did expect them to work hard hard every day and get better. And I never learned anything by losing. Don Wade (October 18, 1997) "A Bird on the Bench is Worth 12,252 In Roberts Stadium Seats", The Evansville Courier, p. C1. It's unbelievable. But I've never been to a pro football game. I've never been to a pro hockey game, either. I guess I'm not much of a sports fan. Dan Shaughnessy (September 7, 1997) "There'll Be No Bird Watching", Boston Globe, p. D1. Larry Guest (December 12, 1993) "In Background, A Legend Trying to Restock Celtics", The Orlando Sentinel, p. C1. Sam Smith (December 25, 1991) "Bird Still Celtics' Main Man - At Age 35, He's Enjoying Basketball More Than Ever", Chicago Tribune, p. 1. 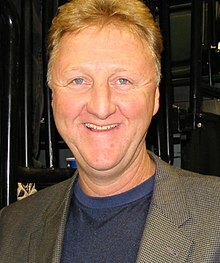 Larry Bird is what keeps me going. He's my measuring stick. I don't think I would be as interested in the game if I weren't trying to play better than him. Magic Johnson — reported in Alan Goldstein (February 7, 1988) "Five at the Top of Their Game; Bird, Johnson aren't alone anymore as best players in the NBA", Baltimore Sun, p. 19. Larry is different than people think. He really loves the game and is really smart. He has the innate ability to focus on what's important and has a great feel for players. He knows how to deal with people. He's direct and definite. I think the players appreciate that. Donnie Walsh — reported in Sam Smith (February 8, 2004) "Bird sets fast pace - Hall of Fame player and former coach Larry Bird finds 'every day's exciting' in his first go-around as general manager of the Indiana Pacers", Chicago Tribune, p. 11. Chris Mullin — reported in John Brennan (May 30, 1999) "Pacers: Timing Is On Our Side", The Record, p. S1. Reggie Miller — reported in Associated Press (May 12, 1998) "Report Says Bird Is Coach of the Year", The Orlando Sentinel, p. C4. It's not what he says, it is how he says it that is making the difference. He doesn't scream at you, he doesn't embarrass you when you make a mistake. He just looks at you, and you get the message. Then when the time is right, he'll talk to you calmly and explain what he wants. Travis Best — reported in The Hawk Eye staff (January 16, 1998) "Bird achieves", The Hawk Eye. Magic Johnson — reported in David Steele (May 9, 1997) "Magic Says Bird Will Succeed", San Francisco Chronicle, p. B8.